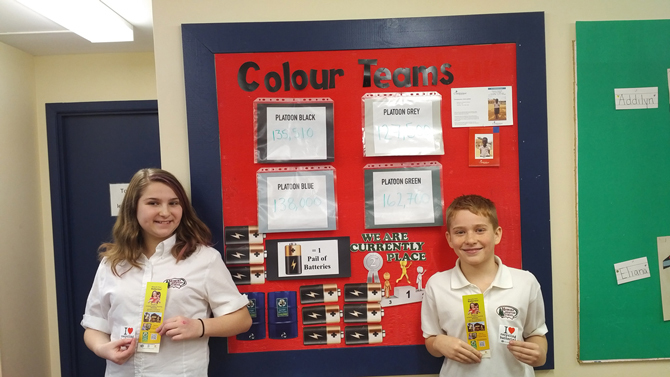 Home » The Battery Recycling Blog » Catching Up with Muskoka Christian School! On Wednesday, Mike Kersley of Raw Materials Company began a three day trek across some of the most beautiful parts of our great Province to visit with schools participating in the Ontario Schools Battery Recycling Challenge. During his travels, he caught up with Andrea Clarke, the Librarian at Muskoka Christian School. This is MCS' first year in the Challenge and they're currently sitting in second place! Mike Kersley: It’s Muskoka Christian School’s first year participating in the OSBRC, how did the school get off to such a great start? Andrea Clarke: Muskoka Christian School is a small school with very enthusiastic families. We have great school spirit, so it wasn't hard to get the students and their families involved. MK: What communications tools or methods do you use to promote the program at school, and how does that information get home to parents and to the surrounding community? AC: Most of our communication with families is sent through Facebook. We also have exciting announcements about once a month to update the children during assembly and we have our own "Battery Brigadier" Sarah to help spread the word! We have a board near the washrooms that shows the children where we are on the leaderboard, and of course the children are constantly asking how we're doing in the challenge and how many more buckets we need to win! MK: Where do you place your recycling containers at the school? AC: At first we had the drum and the bucket in the front entrance, but after the first pick up, the children were excited enough and remembered often, so we moved the drum out of the way and into the staff room. However, the collection bucket remains at the front entrance and it's very visible. MK: Does the school use any of the OSBRC resources offered online? If so, which resources have you found useful? AC: Oh, yes! We sent out an email to all of the staff about the battery challenge as soon as it was available to let the teachers know what was going on. We hung up the posters around the school. We showed the video to students in October so they would understand how valuable dead batteries can be when recycled. We have all learned so much from your resources. Thank you for them! MK: Have you noticed a change in behaviour or attitude toward recycling in general or have you noticed an increase or decrease in the recycling of other materials at the school? AC: MCS believes that we are to be good stewards of what we have been given and has a very strict recycling program in place already. However, batteries were something that students didn't think their families were very good at recycling, which is why we had started our own dead battery drive. We were so excited to find out that you would come and pick them up, and that a prize was even a possibility! So, we have noticed a huge improvement in our battery recycling, but I haven't noticed a big improvement, but certainly not a decrease of other items being recycled. MK: What do you think is motivating people at your school to do so well? Are you doing it for the environment, the prize money, to donate to SickKids or all the above? Maybe there’s another reason? AC: We started our dead battery collection to help the community recycle their batteries more conveniently, so we started out to help the environment. But now, I would say "All of the above". The prize money would be so helpful to our small school and we LOVE that the SickKids Foundation receives a portion, even if we don't win. Plus, it has given us a way to help our community that has been so helpful to us! MK: If Muskoka Christian School ends up winning a share of the prize money, what would it use it for? AC: If Muskoka Christian School is fortunate enough to win a share in the prize pool, we would like to use it to upgrade our non-fiction section of the library. We realized in the summer that we really needed to improve and update our recycling and environmental section, and felt this would be an appropriate use for the winnings. MK: Thank you for sharing some great ideas with the group! We wish you the best of luck in the Challenge this year!